A few posts back when I reviewed 100 Nights of Hero, I briefly discussed the concept of classic storytelling. And as time moves on, we are slowly getting away from the storytelling methods of our ancestors. We need to get back to those times. 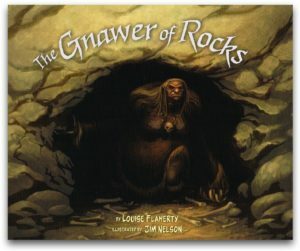 The Gnawer of Rocks is a great example of why. The tale comes to us from Louise Flaherty as she remembers it as told to her classroom in the 1970s by storyteller Levi Iqulugjuaq. The Gnawer of Rocks is a classic Inuit tale that has been passed down from a time when stories like this were meant to teach as well as entertain. The book is short and structured like a picture book with an elongated shape and more narration than dialogue. The art of Jim Nelson does this creepy story justice with dark tones and a color palette of reds, browns, and grays. My only issue with the art is the ultra bright white word balloons against the dark panels. I would have liked to have seen a light gray bubble or a dark ivory to blend a bit more into the panels like the caption boxes. The story centers around a couple of young girls that go exploring only to find themselves in a cave, captured by a mystical woman that has been stealing local children. The story then becomes a tale of survival as the girls devise a plan to get out. This story is great. Honestly, I want more. It’s short. Can we put this dreary tale in a book with some other dark tales? Make a collection out of some of these powerful Inuit stories? Maybe mix them with some prose? Forgive the suggestions. I only mean it as a compliment. I enjoyed this book. I enjoy classic stories. There are so few these days.